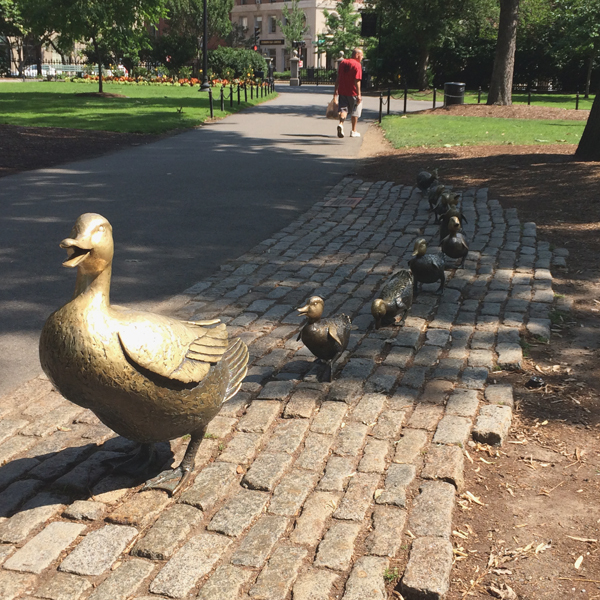 The title for this post was inspired by the Make Way for Ducklings bronze sculpture at the Boston Public Garden. The sculpture by Nancy Schön was installed in 1987 to honor Robert McCloskey and his most popular book, “Make Way for Ducklings”. In the book, Mr. & Mrs. Mallard were looking for a place to start a family, flying over Boston and landing in a few places that did not meet their approval until they reached an island in the Charles River. After the ducklings hatched and had time to learn to be ducks, the family decided to take a field trip to the Boston Public Garden and along the way, policemen had to stop traffic to allow the family to cross safely. Make way for hajusuuri as I take you perfume shop hopping in Boston’s Back Bay and North End neighborhoods. By sheer coincidence, an “Island” met my approval. Read on! I went to Boston several days before embarking on a cruise1. Although I had visited Boston previously on vacation and on business trips, they were before I became a perfumista. This time around, I paid more attention to places that sold perfumes. I was particularly motivated to seek out samples to participate in the Now Smell This Scent of the Day Friday Community Project. The highlight of my Boston visit was a meet-up with fellow perfumista Patricia, a contributing writer at Bois de Jasmin and with whom I had often swapped perfumes. I stayed at the Westin at Copley Square, right at the heart of Boston’s Back Bay neighborhood and within a short walking distance from the Back Bay Station. I took the train into Boston from New Jersey and I have to say that despite it taking 5 hours end-to-end, it was more pleasant than flying and all its security preambles and cramped seats. The hotel is connected via sky bridge to Copley Place (100 Huntington Ave.), an upscale mall featuring Neiman Marcus and Barneys. At Neiman Marcus, I only stopped by the men’s perfume section where Francis Kurkdjian, Tom Ford and Acqua Di Parma perfumes were prominently displayed. The Barneys perfume section was tiny as compared with the store in New York; however, it does have those Frederic Malle smelling tubes where you can experience how the perfume projects around you. On a rainy day, Copley Place is an ideal place to browse around. Chanel (8 Newbury St.)– Color me surprised when I saw testers for Les Exclusifs Parfum Extrait Chanel 1932 and Jersey! The SA was attentive and willingly gave out samples of the Les Exclusifs. Per the SA, Chanel allowed 6 boutiques in the U.S. to make 2 extraits available for testing although she did not know which other locations had the testers. I’m so impressed with this Chanel boutique that if ever I have a “need” to purchase any Chanel item, I will order through this Boston location. Cartier (40 Newbury St.) – This Cartier location looked more posh than the one in New York. Unlike the New York boutique where the perfumes were tucked away in a corner, this location has the perfumes prominently displayed near the entrance, facing the cashier; however, only two of the 13 Les Heures collection were available for testing. Bluemercury (160 Newbury St.) – Bluemercury is a luxury beauty products and spa retail chain. The chain is frequently compared to Ulta and Space NK with their breadth of choices of higher-end branded beauty products. The SA generously gifted me with La Mer, ReVive and Jo Malone samples. I should note that I was initially reluctant to walk in because my experience at a Bluemercury in New Jersey was quite opposite – despite having bought perfume, the SA refused to give me any samples; I’m glad I went in to this Bluemercury and my view of Bluemercury improved. Hermes (320 Boylston St.) –Boylston St. borders the Boston Public Garden. As with other Hermes boutiques in the U.S. and in other countries, the service at this Hermes boutique was top-notch. I happily left with a handful of samples. Blackstone’s of Beacon Hill (46 Charles St.) – This store beckoned to me with its display of collectibles, ornaments, bags, stationery and other gift items. It carries the Soap Paper Factory products including solid perfumes, candles, hand creams and bar soaps. Boston’s North End neighborhood is best known for its Italian-American flavor. I met Bois de Jasmin contributing writer, Patricia, for lunch at Gennaro’s (5 North Square), a quaint restaurant serving Italian soul food. After a sumptuous lunch, we walked to Officina 189 (189 North St.). From the outside, it looked like a second hand boutique, but upon walking in, we were met with an eclectic mix of jewelry, watches, leather bags, bicycles (bicycles? yes, bicycles, with brightly-colored frames), candles, body products and perfumes. 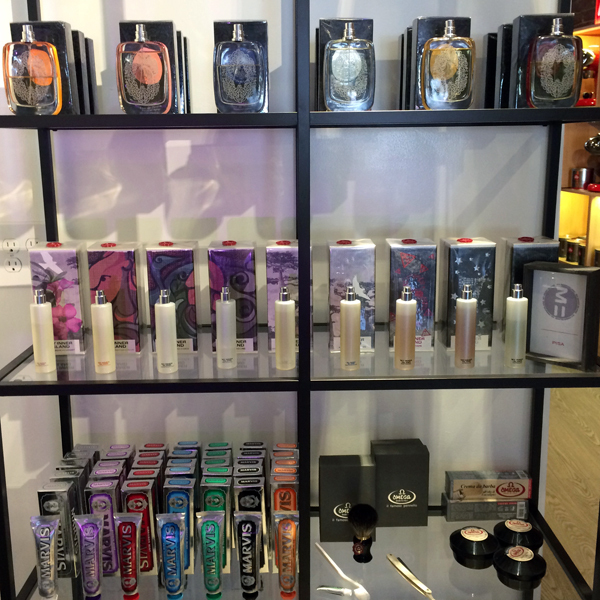 The SA welcomed us warmly and helped us smell through the range of perfumes. 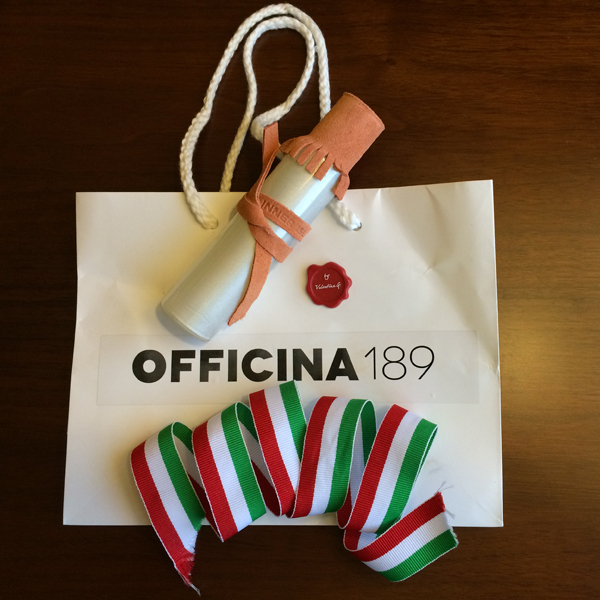 Officina 189 carries only Italian-made products; the perfume brands available include: Acqua dell’Elbe, La Collina Toscana, My Inner Island and Nobile 1942. We left without purchasing anything – Patricia liked several perfumes but since she is in the area often, opted to take her time deciding; I, on the other hand, was itching to get one of the perfumes but was concerned I could not fit it into my luggage. We then walked off our meal with a stroll by the water and parted ways with a promise to continue enabling each other and other perfumistas. Before walking back to Back Bay, I stopped in Mike’s Pastry Shop for people watching, Boston Cream Puff and coffee. When I got back to the hotel, my mind was still on one of the perfumes I smelled at Officina 189, so I weighed my luggage and determined that I do have room. I went back the next day and bought an Island that I approved – My Inner Island Vaniglia Sopraffina e Rhum. And now – a giveaway! To continue her enabling ways, hajusuuri offers a 3 ml decant of My Inner Island Vaniglia Sopraffina e Rhum AND 3 other vanilla-based perfumes in her collection. This giveaway is open to everyone worldwide. To be entered answer the question below AND tell in what country you live. The giveaway is open until 11:59PM PST on September 29, 2014. The winner will be chosen via random.org and announced in a future post. Please note that neither Undina nor hajusuuri is responsible for replacing the decants if they were to get lost or damaged. If you do not want to participate in the draw, there’s no need mentioning the country where you live but please answer the question below for Undina’s statistics post. Which city in the World is your mecca for perfume shopping: not sniffing, testing or getting to know brands and their offerings but actually buying perfumes – based on your previous experience? 1 Holland America New England Cruise from Boston to Montreal, with stops in Bar Harbor (Maine), Nova Scotia (Halifax, Sydney and Prince Edward Island) and Quebec City.